I came across this quote in Backyard Bird Shop's holiday newsletter and thought it was apropos. The pot is my "volunteer pot" where I stick my plant volunteers that pop up in the yard. Mostly, my volunteers are are invasive weeds, but sometimes I'm not sure or think they look pretty in some way. I'm pretty sure one of these is a sarcococca volunteer. Not sure about the one with the bright green leaves. 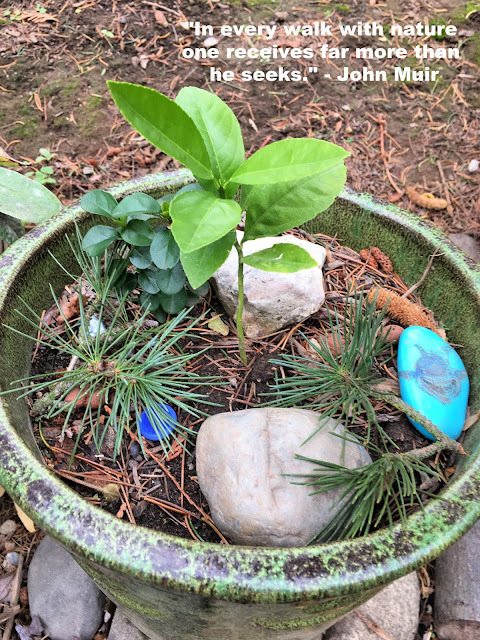 The brightly painted blue stone was a gift tucked away for a passerby that my littlest one found in Post Falls, Idaho last month. The two rocks and bright blue shiny object are random collections from our travels. The crows in our backyard like to pick up the bright shiny ones and drop them in other places in the yard. They seem to be particular about where they go. I'm always finding them in a new location. I'm busy this weekend working my nursing shifts while also precepting a senior nursing student. Hope you are somewhere finding a moment or two to enjoy this beautiful fall weather we've been having here in the Willamette Valley.